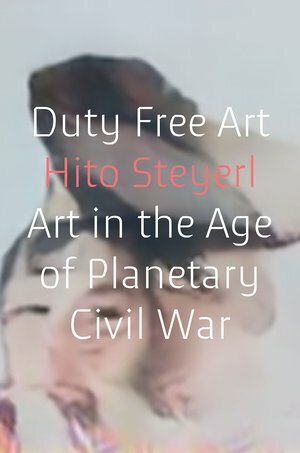 In her newest book 'Duty Free Art: Art in the Age of Planetary Civil War', artist/theorist Hito Steyerl provides an unflinching analysis of what it means to create and consume art in the present age. Across this collection of short essays, Steyerl threads together the consequences of neo-liberalism on visual culture and art production, criticizing everything from WikiLeaks, digital surveillance, militarism and big-data to contemporary art, art museums and art fairs. Although this diverse and dense range of subjects may at first seem intimidating, it is Steyerl’s piercing wit and concise combination of high theory and pop culture that makes the book easily digestible and accessible to a broad range of readers. Beware: If you haven’t approached such topics before, reading this book will change how you think about art and its political attachments. It is arresting, thought-provoking and utterly addictive - leaving you breathless and needing to come up for air. What can we do when arms manufacturers sponsor museums, and some of the world’s most valuable artworks are used as currency in a global futures market detached from productive work? Can we distinguish between information, fake news, and the digital white noise that bombards our everyday lives? Exploring subjects as diverse as video games, WikiLeaks files, the proliferation of freeports, and political actions, she exposes the paradoxes within globalization, political economies, visual culture, and the status of art production.